Sunday: Hazy, hot, humid. Windy; highs in the 90s. Sunday night: Muggy and mostly clear. Lows in the 60s and 70s. A strong low-pressure system passing north of New England, combined with high-pressure to the south of New England, is generating a warm to hot breeze for our Sunday. Temperatures away from the south facing shore are 90 to 95 degrees, while the beaches facing the south hold in the 70s. Humidity is moderate today with the dew point in the 50s. Ocean water temperatures are in the 50s. Wind at the south facing beaches may gust past 30 miles an hour from the southwest, otherwise winds are generally 10 to 20 miles per hour. In northern most Maine, we have a threat for thunderstorms and winds are gusting past 40 miles per hour. There's also an air quality alert for today with elevated levels of ozone. It will be mostly clear tonight with temperatures slowly falling from the 80s to 70s, with the rural areas falling into the 60s. Tomorrow is sunny and hot with temperatures 90 to 95 degrees. It will be a little bit less breezy. 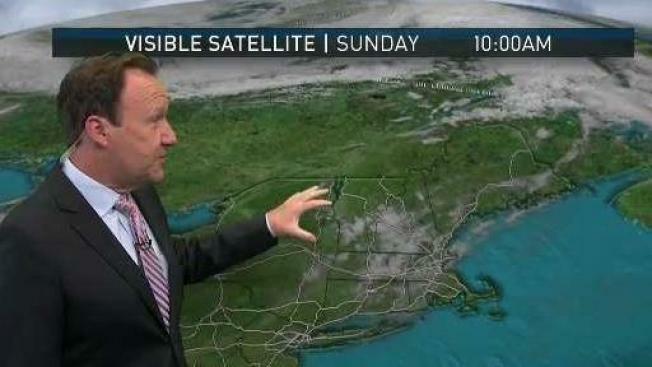 A cold front from Canada moves across New England on Tuesday with a shower or thunderstorm, and temperatures will once again be near 90 degrees. Any thunderstorm on Tuesday has potential for damaging wind and a quick burst of heavy rain. That front will push south of New England for Wednesday with increasing sunshine and a high temperature in the 70s. The front will try and come back as a warm front on Thursday with a mixture of sun and clouds, perhaps a shower. On Friday, the front is right over us with mostly cloudy skies and a shower or thunderstorm, high temperature in the 70s. Next weekend's weather outlook is a challenge, as we have an upper level low pressure system overhead with the threat for showers. But it's too early to call it a rainy weekend.